On 21 March, South Africa celebrates Human Rights Day. This day is a commemoration of the 1960 Sharpeville Massacre and how far the nation has come in the protection of fundamental human rights. Today the fundamental rights of South Africans are enshrined in our Constitution under the Bill of Rights. The Bill of Rights is a cornerstone of democracy in South Africa. It enshrines the rights of all people in the country and affirms the democratic values of human dignity, equality and freedom. The Bill of Rights was born out of the amalgamation of the universal fight against injustice that took place after the Second World War, and the fight against the inhumane rule of the Apartheid Government in South Africa. The Bill of Rights as we know it today is deeply informed by two vital documents in the history of fight for human justice: the Universal Declaration of Human Rights and the South African Freedom Charter. In 1948, the same year the Apartheid Government came to power, the people of the world came together at the first United Nations General Assembly to enshrine a document against injustice, discrimination and oppression across the globe: the Universal Declaration of Human Rights. In the aftermath of the Second World War the countries of the world banded together to form the United Nations. One of the first tasks this august body set for itself was to put to word their vision for a world in which the atrocities of the Second World War could never happen again. This new, post-war world would be one of justice, dignity and peace. The cornerstone of this new vision was the Universal Declaration of Human Rights, a document which enshrines the rights to dignity, equality and justice for all people. 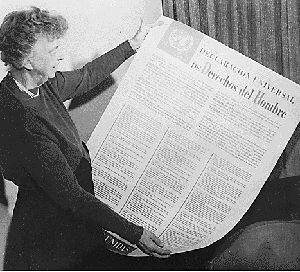 The Universal Declaration of Human Rights was put together by a specially appointed Human Rights Commission. In order to make this document applicable to all it was intended that this commission be as representative of the global population as possible. The member states in the commission were: Australia, Belgium, Byelorussian Soviet Socialist Republic, Chile, Republic of China, Egypt, France, India, Iran, Lebanon, Panama, Philippines, United Kingdom of Great Britain, United States of America, Union of Soviet Socialist Republics, Uruguay and Yugoslavia, a wide range of countries, but with a notable absence of African states. The Universal Declaration of Human Rights cemented the, at the time, reasonably novel idea that people have fundamental rights that must be upheld and protected no matter where they live or who they are. This formed a pivotal part of the new world order in which the universal rights of the human trumped the regional rights created by the state. On December 10 1948, the Universal Declaration of Human Rights was adopted by the United Nations General Assembly with 48 countries voting in favour, none voting against and eight countries abstaining. South Africa was one of the eight countries that refused to sign this seminal human rights document. This was in large part because South Africa was already under the rule of the National Party Government, a government that was preparing to implement Apartheid, a system which would systematically violate every one of the rights recognised in the declaration. The second document to have deeply informed the South African Bill of Rights was the Freedom Charter. The Freedom Charter is one of the most important documents for equality and justice to have emerged in South African history. In 1955 the ANC sent fifty thousand volunteers across the country to gather the 'freedom demands' of the people, from those in townships to rural homesteads, to be put into their new charter. They gathered the demands of the people, such as 'land to be given to all landless people', 'living wages and shorter hours of work' and 'free and compulsory education, irrespective of colour, race or nationality', and collected them all into one final document. On 26 June 1955, the Congress of the People, a multi-racial body of 3 000 South Africans from all walks of life, met in Kliptown to ratify the document that was to become the Freedom Charter. The Freedom Charter became the common programme enshrining the hopes and aspirations of all the progressive people of South Africa. The opening demand of the Freedom Charter, which is seen to encapsulate the essence of the document, is the cry: "The People Shall Govern!". ‘Why will this assembly be significant and unique? Its size, I hope, will make it unique. But above all its multi-racial nature and its noble objectives will make it unique because it will be the first time in the history of our multi-racial nation that its people from all walks of life will meet as equals, irrespective of race, colour and creed, to formulate a Freedom Charter for all people in the country’. The Freedom Charter was envisaged by its writers as a document "for the democratic South Africa of the future”, a document which encapsulated both the rights and hopes of all South Africans. Almost half a century later, after the fall of Apartheid and the rise of the new ANC Government, the hopes of the creators of the Freedom Charter, to create a document for the democratic South Africa of the future, would finally come into being. With the writing of the new Constitution the South African Government also sought to create a document which would honour the rights of the people of the country. This document which would incorporate both the demands of everyday South Africans as outlined in the Freedom Charter, and the universal rights of all human beings, as outlined in the Universal Declaration of Human Rights. They called this document The Bill of Rights. Until the first democratic election on 27 April 1994, the vast majority of South Africans had been excluded from participating in government, and subjected to a wide variety of human rights violations. It was only when South Africa became a constitutional democracy in 1994 that those human rights of all South Africans, as expressed in the Freedom Charter, finally received protection in our Bill of Rights. The Bill of Rights as it stands today is one of the most important documents of the new South Africa as it holds the Government accountable to protecting the rights and dignity of all the citizens of the nation. • African National Congress, ‘The Freedom Charter’, [Online], Available at https://www.anc.org.za/show.php?id=72[Accessed 18 March 2015]. • South African History Archive, ‘The history of the Bill of Rights’, [Online] Available at https://www.saha.org.za/billofrights/the_birth_of_the_bill_of_rights.htm[Accessed 18 March 2015]. 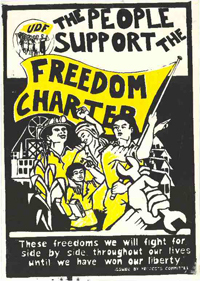 • South African History Online, ‘Freedom Charter, 1955’, [Online], Available at https://www.sahistory.org.za/topic/freedom-charter-1955[Accessed 18 March 2015]. • United Nations Organisation, ‘The Universal Declaration of Human Rights: History of the Document’ [Online], Available at https://www.un.org/en/documents/udhr/history.shtml[Accessed 18 March 2015]. • United for Human Rights, ‘A brief history of Human Rights’, [Online], Available at https://www.humanrights.com/what-are-human-rights/brief-history/the-united-nations.html[Accessed 18 March 2015].